The ignition must be switched ON for the power windows to operate. Make sure the opening is clear before closing a window: Closing a power window is dangerous. A person's hands, head, or even neck could be caught by the window and result in serious injury or even death. This warning applies especially to children. Never allow children to play with power window switches: Power window switches that are not locked with the power window lock switch would allow children to operate power windows unintentionally, which could result in serious injury if a child's hands, head or neck becomes caught by the window. To prevent burning out the fuse and damaging the power window system, do not open or close more than three windows at once. A power window may no longer open/ close if you continue to press the switch after fully opening/closing the power window. 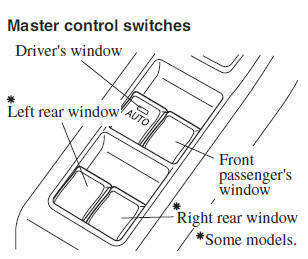 If the power window does not open/close, wait a moment and then operate the switch again. To open the window to the desired position, lightly hold down the switch. To close the window to the desired position, lightly pull up the switch. To fully open the window automatically, press the switch completely down, then release. The window will fully open automatically. To fully close the window automatically, pull the switch completely up, then release. The window will fully close automatically. To stop the window partway, pull or press the switch in the opposite direction and then release it. 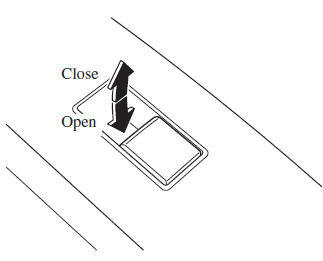 If the battery was disconnected during vehicle maintenance, or for other reasons (such as a switch continues to be operated after the window is fully open/closed), the window will not fully open and close automatically. The power window auto function will only resume on a power window that has been reset. Make sure that the power window lock switch located on the driver's door is not depressed. Press the switch and fully open the window. Pull up the switch to fully close the window and continue holding the switch for about 2 seconds after the window fully closed. If a person's hands, head or an object blocks the window during the auto-closing operation, the window will stop and open halfway. Make sure nothing blocks the window just before it reaches the fully closed position or while holding up the power window switch: Blocking the power window just before it reaches the fully closed position or while holding up the power window switch is dangerous. In this case, the jam-safe function cannot prevent the window from closing all the way. If fi ngers are caught, serious injuries could occur. Depending on driving conditions, a closing power window could stop and start opening when the window feels a shock that is similar to something blocking it. In the event the jam-safe function activates and the power window cannot be closed automatically, pull and hold the switch and the window will close. The jam-safe window function does not operate until the system has been reset. The power window can be operated for about 40 seconds after the ignition is switched from ON to off with all doors closed. If any door is opened, the power window will stop operating. 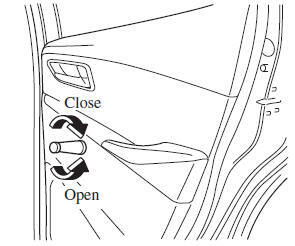 For engine-off operation of the power window, the switch must be held up fi rmly throughout window closure because the auto-closing function will be inoperable. To open the window to the desired position, hold down the switch. To close the window to the desired position, pull up the switch. 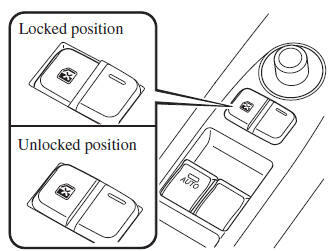 The power windows may be operated when the power window lock switch on the driver's door is in the unlocked position. 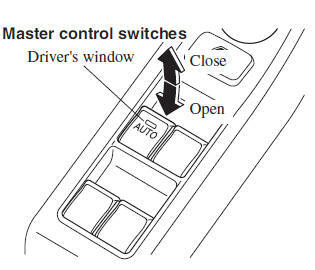 The passenger windows may be opened or closed using the master control switches on the driver's door. This feature prevents all power windows from operating, except the driver's power window. Keep this switch in the locked position while children are in the vehicle. Locked position (button depressed): Only the driver's power window can be operated. 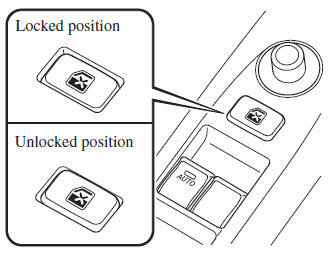 Unlocked position (button not depressed): All power windows on each door can be operated. To open and close the window turn the handle on the door.